If you close your eyes and imagine yourself sitting in math class back when you were in elementary school, what do you see? Chances are the teacher is at the chalkboard or overhead and you and your classmates are sitting at your desks with your books open, following along with the teacher (or not). A few kids are called to the front to work problems on the board, the teacher assigns problems from the book, gives the class some time to work and that's it. Was that method successful? For some, but for many...no. Lots of kiddos decided they just weren't good at math. The problem with this is if you've decided you're just not good at math...you are shutting doors. There are lots and lots of professions that are simply not open to you when you "don't get math". That's not what I want for my students. I want them to have every opportunity available to them. Did you know that 78% of adults can't explain how to compute interest paid on a loan? 71% can't calculate miles per gallon? 58% can't calculate a 10% tip at a restaurant! It's clear that old model just isn't working, yet many teachers still employ that traditional, whole-class model. Reading instruction has changed from the old model to one that is child-centered. The same changes are called for in math instruction. We need and effective means to reach ALL students, regardless of their readiness level. Think about those Common Core Standards. There's more process than just content. That old model just won't meet those standards. 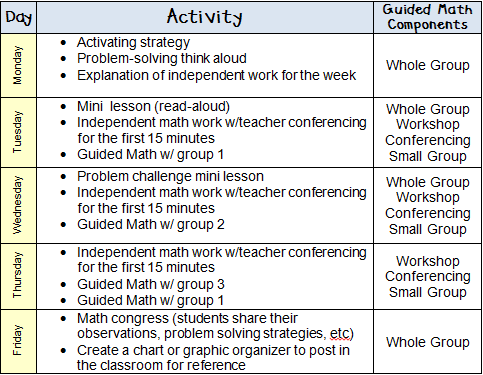 So- what is Guided Math? How does it work? What does it look like in a classroom? A Classroom Environment of Numeracy- Most teachers set up their classrooms so that all who enter know that literacy is valued. Can the same be said for numeracy? We need to set up math-rich classrooms just as we do print-rich, and establish an environment in which children feel respected, supported, and are comfortable taking risks in problem solving and sharing their thinking. 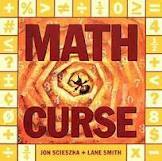 We need to strive to put a "Math Curse" on our students....where they begin to see math EVERYWHERE. Math Warm-Ups & Calendar Activities-Simple daily activities that help get those math muscles moving. You may have your students add to a "Number of the Day" chart every day. 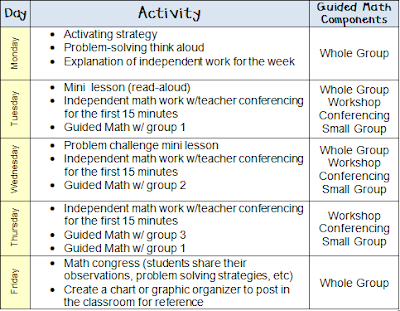 You might have a math focus wall with activities that help students review previous concepts, preview ones coming up, & provide practice with math facts or problem solving. It's important to note that these activities are mostly oral--this fosters those important conversations about math & encourages a deeper understanding. Whole Class Instruction- Are you surprised? There's a place for whole group in Guided Math! It's just not the only method of instruction. Whole group is an excellent venue for introducing or reviewing a concept, presenting activating strategies, or presenting literature connections at the beginning of a unit. Small Group Instruction- Students are assessed formally or informally (Did that surprise you? It did me...I thought it had to e formal). Students are grouped based on those assessments. Here's another surprise: Not only can the time for each group differ, but so can the content being taught. Math Workshop- The answer to the proverbial question: What are the read of the kids doing while I'm in small group? Participating in workshop tasks like math games, problem of the week. Math Journals, written practice of previous skills, center activities, or inquiries. Individual Conferences- Just like we conference with students during reading or writing, teachers can meet with kiddos to support understanding. Ongoing System of Assessment- This is how we determine the needs of the class and of individuals. Formative and summative assessments can give us valuable information. But not all of it has to be done every day! You can choose the various components as they apply to your class. You can choose from the menu below. Sammons suggests teachers begin with just a few of the components and gradually add more. What might a week look like in the classroom? Sammons offers this example of what a week of Guided Math might look like. Of course, this would be adjusted based on what's going on in YOUR classroom. As she says, this is just "an example of the kind of flexibility the framework offers". I love this model! I actually feel a little liberated. Small Group doesn't have to be every day. Informal assessment is valued, too. Workshop doesn't have to happen every day, either. Did you have any surprises? Questions? Concerns? Revelations? I'd love to hear them! Let's discuss! Leave a comment, add to the stixy, or link up. Let's get this party study started! Have you heard about stixy? It's basically an online bulletin board where you can add virtual sticky notes. I've set one up for this chapter...please go check it out! Once you get there, all you have to do is click on "note" down at the bottom, drag it up to the board, & an option menu will appear on the right. Have fun! See you there! I know! I really like it too....& that even within that plan the days can be moved around as needed. I love that the framework is flexible and responsive to student and teacher needs. I've fixed stixy. Just one little box I forgot to check! Looking forward to hearing/reading everyone else's thoughts! I'm still waiting on my book so thank you for giving me a preview. It is a relief to know that the small group lessons aren't as frequent as they are with guided reading. When I looked at the length of my math block combined with the length of my math lessons, I just couldn't see how to make it all work. When it says 15 min. of independent math work with teacher conferencing, do you think that could be used to meet with a small group to do a couple of the math boxes together? Just out of curiosity, how long do you have for your math block and how is it broken down? Math Warm-Ups/Daily Review 10 min. Lesson & Journal Pages to Accompany Lesson 30+ min. What a great introduction to the chapter. Using this book with Math Work Stations next year will make my math time ROCK! Great points about the first chapter. I really like the stixy too. What a great idea. I'm excited to delve into the next chapters. Thank you for doing this. I'm so excited to join this book study. My book is supposed to come in the mail Wednesday, so I'll link up then! That's nice to hear that you don't need to try to meet with each small group every day and some days can be more whole group lessons. Thanks for the great introduction! I just ordered the book, so I'll be a little bit behind, but better late than never! I look forward to chatting about the book! PS: I am a brand new teacher blogger and would love for you to stop by! Yes, I too enjoy the layout of GM for its flexibility. It's a bit tricky as in my bldg we switch for Math and only have 60 min. which includes settling down time and packing up to switch back. Last year was the district's 1st year for Accelerated Math and Acc LA and Regular Math and LA (it replaced our gifted ed program/my previous position). I teach Acc LA and Reg Math then my homeroom for all other subjects is a heterogeneous group. Next year we are trying a new format to assist in the transition. I love Math; it's my favorite subject and I totally agree with the showing of numeracy EVERYWHERE! We talk literacy but often forget that math is a language too. I tell this to my parents/students all the time - leading with Math Curse. For me since I teach 5th grade, when Sammons emphasized (from Hyde 06) that by 4th/5th grade children seem to have lost the prob. solv. skills they began in K this hit the spot. So true, so I set my mind to use prob solv assessments as one way to group my students. Laura Candler has an spectacular problem solving, "Daily Math Puzzlers" program that I'm wanting to incorporate with my district resource. Gr8 1st Chapter; outlining GM. I really like this...going to have to check out that book! Thanks for hosting this book study! 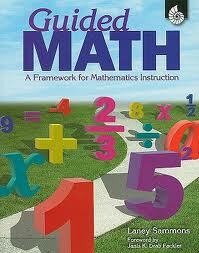 Implementing guided math is my major goal for next year. I've linked up my brand new blog to share my thoughts on Chapter 1. What I am really loving is how much this correlated with my district's Math Investigations program! I can't wait to get everything started. This is really going to be beneficial for the kiddos. I love Math Workshop and when I moved to 3rd grade, it didn't work as well for me as it had in the past. So I just ordered this book and can't wait to join the study. Thanks! Nikki (I don't have a blog). Tomorrow's goal will be to post about the Guided Math, I just hope it will be as good as this! I am so glad to find your blog and learn about your book study. I am your newest follower. Just ordered my book. Thanks for the great discussion. I can breathe a sigh of relief! I feel very comfortable with Guided Reading & it is my favorite part of the day! But I could never wrap my brain around how to do accomplish the same in math. It always seemed impossible to teach a concept whole group, allow exploration or independent study, and meet with small groups every day. What a relief to see - it does not have to be that way. I'm loving this book! I also am in love with stixy! That will definitely be used in my classroom next year! I just blogged about chapter 1 using the Review and Reflect questions at the end of the book. So good. It sort of makes me want to teach math NOW (but then I remember how much I love my leisurely summer). I just found your blog and book study, guess I've been a victim of Summer :) I've taught Kinder the last 4 years and pretty much followed a similar schedule. I was killing myself trying to figure out a way to see more groups, but I finally settled on one group a day, but helping my neediest at least 3 times a week. I'm your newest follower and will be following your book study, seeing as how I'm moving back to First next year. Sorry about that, Patti! It's back up....link away! Glad to have you on board!! Glad to have you on board! I'm excited to see the other chapters unfold! Thanks so much for putting this book study together. I have been wanting to read this book since last summer and the book study actually got me to order the book. Looking forward to sharing and learning lots of new info! So glad you're joining us! I think you'll be very pleased with the book. What great websites you (and others) have put together. I am thrilled to see so many people that are passionate about teaching and doing everything they can to improve the lives of their students. I am coming up on my 2nd year of teaching 7th grade math (I spent 8 years in 6th grade math) and I am curious how this book applies to the middle school environment. Would any of you guys reccommend this book for a 7th grade teacher? The concepts seem very interesting, as the traditional classroom has always bored me. Thanks again for everything you guys do! I think it's appropriate for students of all ages. It's a framework for how differentiated instruction can be delivered in math. We do have a couple middle school teachers who are hosting a couple of the chapters. Click on the Guided Math button up on the right...you'll go to the Book Study page where all the hosts are listed. Check out Making It as a Middle School Teacher and Joy in 6th.